It's becoming quite apparently that after some sort of emotional event, I am my most creative. I've been working on building a board on Pinterest for decorating my room for the last 8 weeks. Now that I've decided on wall colors it was time figure out what would go on them. After a simple Pinterest and Google search of 'Wall Art' I came across photo transfers to wooden blocks that looked pretty cool-- but wood blocks would be difficult to mount. So I thought about it, and I've been wanting to do something with canvas for a while-- last year I bought 3 large canvas, printed off some large photos and planned on decupaging the images on... but then I realized I could probably do a photo transfer like the wooden blocks on canvas. 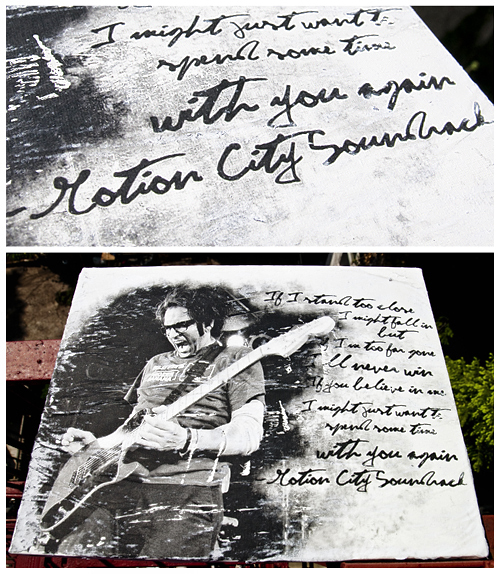 This one of Justin Pierre of Motion City Soundtrack with lyrics to their song "Stand Too Close" came out much better than expected! So much so, when I posted the image on Twitter, Justin asked me about a print of it! Crazy.